At the end of October ‘The Laboratory of Bioinformatics and Human Electrophysiology, Department of Informatics of the Ionian University (Greece) travelled to remote Toronto Canada where 'GeNeDis 2018:Health Aging and Mental Wellness in the new digital era', took place. Professor Panayiotis Vlamos, Head of the Department and his research team announced a completed computational methodology ‘AD Blank Spot to study neurodegenerative diseases. This new methodology has been developed and implemented at the BiHELab and it has been evaluated and approved as a research product. Professor Panayiotis Vlamos further explained that the presented methodology is applied to slowly evolving, non-genetic diseases and is based on the connection of micro- and macro- measurements. The micro-measurements concern submollecular biomarkers existing inside and outside the cell environment, while the macro-measurement estimates the stability of the frailty function of the human body for a specific disease. The connection of those two spaces is achieved through an ‘imaginary’ time-dependent vector space of biomarkers, creating an innovative model which is uniquely characterized by each human organism, serving the purposes of Precision Medicine. Scientists incorporate all the data available in the computational model which records stability or instability areas during the development of the disease. The personalized trajectory of the disease is called AD Blank Spot. Their main aim is safe drug administration which regulates AD Blank Spot to avoid areas of instability. The next top to conquer will be the development of a decision support system, DSS for medical and clinical applications. 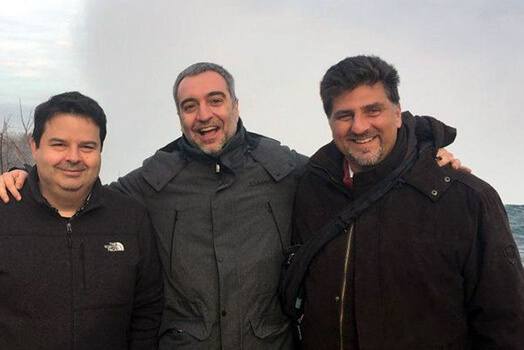 Among several renown scientists, a Greek team consisting of Panayiotis Vlamos, Ioannis Tarnanas and Ilias Kotsireas announced the establishment of the ‘Research Center on Computational Biomarkers – RCCBm' at the conference. The center will be supported by a Foundation based in Zurich, while a research unit will be hosted at CARGO Lab, Wilfrid Laurier University’s Waterloo campus. Ioannis Tarnanas is University of St. Gallen Senior Research associate and an Atlantic Fellow for Equity in Brain Health with GBHI Based at Trinity College Dublin & associate researcher at Swiss Neuro Foundation. He has recently won the EIT Innovators Award by the European Institute of Innovation and Technology. The third part of the research center is Ilias Kotsireas, Director of the CARGO lab at Wilfrid Laurier University with extensive research in the areas of symbolic computation and combinatorial designs. RCCBm’s main target is to upgrade available sources of biological data towards medical accuracy contributing to the generation of innovative models. Based on several biomarkers that define human health it can provide precise diagnostic or prognostic alternatives to patients. The center will embrace Applied Mathematics, Data Mining, Modeling, Biophysics, Biochemistry, Bioinformatics, Neuroinformatics, High‐performance computing and Computational Mathematics in Biology. Worldwide collaborations with health organizations, Hospitals and Pharmaceutical companies are welcomed in the direction of accumulating clinical data at large scales. During a conversation with Panayiotis Vlamos we were informed that the RCCBm has drawn a list which interconnects biomarkers with relevant diseases. When the project enters the next phase, pharmaceutical substances that initially had failed will be tested again. In case it is detected compatibility with the biomarkers of a totally different disease from the one they focused their tests in the first place then things change rapidly. To quote him ‘if our goal is achieved it would be like reviving all the 'failed due to limited specificity' drug substances and giving them a new orientation and a second chance to offer a cure that nobody could have imagined before’. This could practically mean a huge step for Precision Medicine and it could also lead to serious reduction of expenses that can work retrospectively by re-evaluating all these research papers that were thrown in the dustbin lightheartedly. As a result Precision Medicine may bring back to life some experimental treatments and hopefully help millions of people restore a quality of life. Additionally, this cost cutting could pass on to patients decreasing the treatment expenses for a huge number of diseases.